I have a desk calendar that provides daily trivia, facts and such, all about baseball. Today's question: Who was the first player to have his signature engraved into the barrell of a Louisville Slugger bat? (Pause, think it over.) Today's answer: Honus Wager. 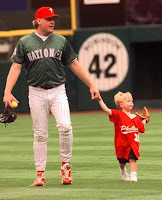 One of the recent calendar entries had to do with Curt Schilling leading our Phillies in wins and K's during the 1990's. When the question was asked, the answer came easy for me. But that got me wondering about who the team's offensive leaders were, for the same decade. The hitting leaders would not come to mind as swiftly. In the categories of HR's and RBI, would it take anyone longer than a second to tell you who led the Phillies in those categories in the 1980's? What about the 2000's? (Pause, think it over) In the 90's, was it Rolen? Dykstra? Kruk? Lieberthal? Abreu? None of those are the correct answer. Darren Daulton led the Phillies in homers during the 1990's with 110. His RBI total also led the team at 466. Mike Schmidt's homer and RBI totals in the 1980's were 313 and 929. Those led the team, of course. Pat Burrell's homer and RBI totals for the 2000's with the Phils were 251 and 827. Schmidt's totals were in 1,320 games. Burrell's totals were in 1,306 games. How did you do at guessing the offensive leaders?